T20 Blast: Would the IPL or Big Bash work in England? Twelve years after giving Twenty20 cricket to the world, England's own version is suffering an identity crisis. While the rest of the planet packs the format with razzmatazz, hype and international stars, the English T20 Blast plods through a summer-long, Friday-night trudge, struggling to fill the biggest grounds. In a bid to play catch-up, the England and Wales Cricket Board is contemplating a franchise-based competition, similar to the Indian Premier League and Australia's Big Bash. But can another revamp breathe much-needed life into the domestic game? How would a rejigged format look? Who wants it? Who's against it? What would fans make of it? And what are the prospects of it actually happening? Where to start? Counties have long struggled to attract punters through the gates, an issue that the invention of Twenty20 sought to address. In some ways, it has been a success - T20 games are the best attended of the three domestic competitions. However, many counties still have huge problems balancing the books and of the £1m loans the ECB offered each of the 18 counties in 2013, more than £7m is still to be repaid. Add to this an apathy from the public, brought about by the lack of cricket on terrestrial television and a governing body that lurches from one crisis to the next. The ECB's own participation figures, released in 2014, showed that 64,000 fewer people between the age of 14 and 65 were playing recreational cricket compared to the previous year. A new T20 competition was launched only last year, with the 18 counties split into two groups of nine and matches played across the summer, leading to the quarter-finals. The average attendance grew slightly, up 12% when compared to the previous five years, but issues remain. "It puts off the best overseas players from joining our league because it is too spread out," said ex-England batsman Kevin Pietersen, a veteran of the leagues in India, Australia and the Caribbean. "It is hard for T20 specialists to stay in form. "Playing the majority of games on Friday nights perhaps does not encourage children and families quite as much as guys on a night out and there are too many dead matches." Plenty in England are looking enviously at the Big Bash, which draws big crowds, attracts big stars and generates big global attention. Instead of the traditional six first-class states, eight city-based franchises compete over a six-week window that coincides with the school summer holidays. Matches are broadcast on free-to-air television. In the most recent edition, the average crowd was 22,000, compared to the 5,772 of last year's T20 Blast. On television, the Big Bash ensured the Ten Network regularly had the most watched programme in its time slot. "The Big Bash is a phenomenon," said Yorkshire's Australian coach Jason Gillespie. "The thing that's impressed me most is the way Cricket Australia has dealt with it. "They realised they needed to move forward and to align with fans' expectations. They've gone with the flow and given it a red-hot go to produce a very well-run competition that's remained within their own control." The ECB is considering a similar model, creating eight or 10 T20 franchises that would remain owned by the Board with profits distributed back to the counties. These teams would have their homes at the major international grounds and be based on cities, rather than counties. Instead of Lancashire v Yorkshire, think Manchester v Leeds. There's plenty of support, both from those on the pitch and in the board room. "For a while now we've been a bit behind the times when it's come to T20 cricket," England fast bowler Steven Finn told BBC Sport. "It would be a great step in the right direction for us if franchises did happen." An internet search shows Finn's views are shared by a who's who of English cricketers - including Pietersen, Jos Buttler, Andrew Flintoff, Michael Carberry, Michael Vaughan, Andrew Gale - enough for an entire T20 squad. Even some who you might expect to be against a franchise system are giving their backing to it. Derbyshire would almost certainly miss out on hosting a franchise, but can see the benefit of a competition that would share wealth throughout the counties. "It is absolutely crucial to us in this country, if we want to get more people into the game to watch and play, that we have a tournament on the scale of the IPL, the Big Bash and the CPL," said Derbyshire chairman Chris Grant. "Derbyshire members naturally get nervous when people talk about franchises because they don't want the Test-match counties getting all the benefit of it, but I don't see it that way. "I believe we could establish an English Premier League with franchises where all 18 first-class counties would be shareholders." The likes of Somerset, Sussex and Essex have found an ideal formula for commercial success, mainly because they have medium-sized grounds that are not used for international cricket but are sold out for domestic Twenty20 games. On the assumption that a new league would have teams based at counties with international grounds - Middlesex, Surrey, Durham, Yorkshire, Lancashire, Warwickshire, Nottinghamshire, Glamorgan, Gloucestershire and Hampshire - those three T20 standard-bearers would miss out. "Let's be absolutely clear, we will have no truck with franchises whatsoever," said Somerset chairman Andy Nash. "We haven't built what we have here in recent years to see the game move away to Bristol. "It's vital the counties are given the chance to compete in whatever reshaped T20 we ultimately conclude is right. "I don't think you'll find anybody at Somerset arguing for a merger with Gloucestershire or anyone else to play with a white ball. It's just not going to happen." Do franchises work in British sport? The idea of pop-up franchises is a relatively alien concept in a British sporting culture that is wedded to the tradition of 'supporting your team'. The nearest example to a T20 franchise system comes in Welsh domestic rugby union, where in 2003, it was agreed that nine clubs would form five regions, now down to four since Celtic Warriors went bust in 2004. While the change has led to an improvement in the fortunes of the national team, the domestic game has struggled. In 2013-14 only one team, the Blues, were hitting the 8,000 target for average attendance, set back in 2003. "The regions haven't had success, particularly in Europe," said former Glamorgan batsman Steve James, now rugby union correspondent for the Telegraph. "Attendances have been poor, the only time they have got big crowds has been for the local derbies." Another important lesson the ECB could learn from Welsh rugby is not to underestimate the negative impact the wrong branding of a team could have on a parochial sporting audience. Take Lancashire, for example. The Red Rose county draws support from Manchester and Liverpool, no doubt including fans of both Manchester United and Liverpool football clubs. 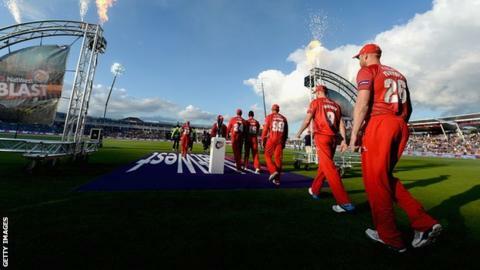 What would be the impact of changing the Lancashire T20 team to Manchester Magic? "Tradition runs very deep," added James. "One of the big problems in Welsh rugby was the names of the teams; Cardiff Blues, Newport-Gwent Dragons, Neath-Swansea Ospreys. A lot of the fans thought they were super-clubs, rather than regions, with the titles eventually shortened to just use the nicknames." There are other problems to consider too, particularly when comparing an English competition to the Big Bash. Firstly, Australia took six states and created eight T20 teams - increasing the availability of live cricket. A slimming-down of the 18 counties to eight or 10 franchises would surely decrease that opportunity. In addition, British sport thrives on rivalries, the passion and desire of a local derby. The cut and thrust of Somerset v Gloucestershire would be lost if the two counties were thrown together in a Bristol team. Identifying this, Australia actually put two teams in each of Sydney and Melbourne in order to manufacture rivalries. That is the big question facing the ECB chief executive Tom Harrison as he carries out a consultation of the counties, players and supporters, with findings scheduled to be returned this winter. Can the ECB find a sweet spot of a Twenty20 competition that not only satisfies traditional fans, but also brings new supporters to the game? Can the interests of the counties ever be completely appeased? Ultimately, it is the ECB board, rather than the 18 clubs, who will decide the way forward. "You have to reinvent yourself without completely ignoring your history," said Warwickshire chief executive Colin Povey. "If we are to make a truly vibrant domestic game, it will be around the T20 game. "You can't turn off your loyal fans, but we cannot close our minds to those people who are in the market for something to do with their family on a Friday night. We have to make sure that cricket is on their radar." If a franchise league is ignored, or is tried and fails, where next?